At about 46:20 of Let's Talk TJ's! 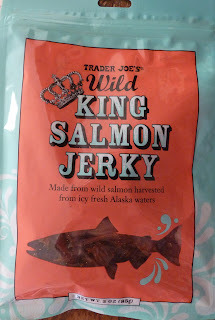 Podcast Episode 6, there's a fairly entertaining discourse about the Wild Salmon Jerky Russ reviewed last year. Near the end of that conversation, I volunteered to be the What's Good at Trader Joe's guinea pig for "Salmon Jerky version 2.0." I try to be a man of my word, so yesterday morning I shelled out the $5.49 for the small three ounce bag and "took one for the team," all in the name of intrepid food blogging. 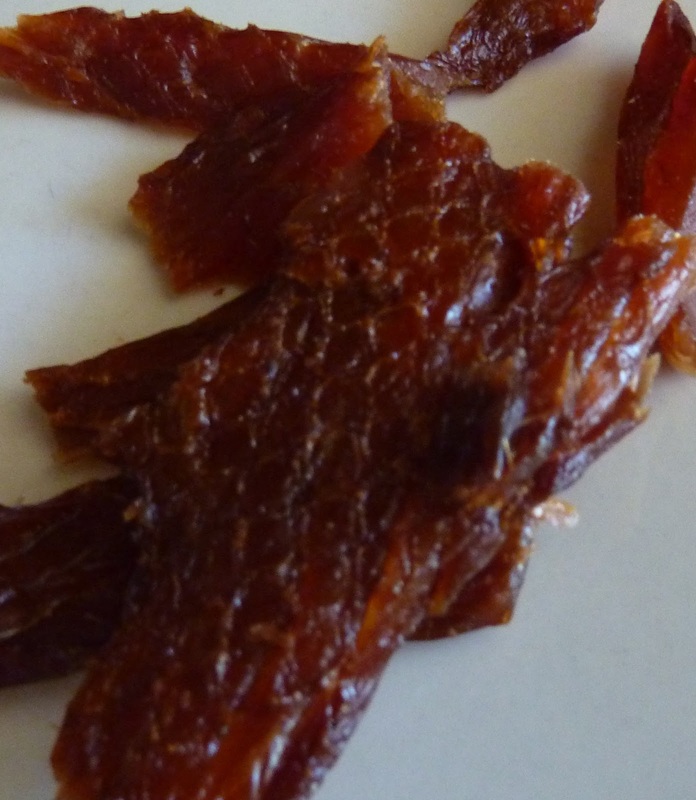 This uncommon jerky is a new product that no longer uses chum salmon as the primary ingredient, but instead employs the use of regal, fresh, Alaskan king salmon. Some have speculated that chum salmon was also sometimes referred to as "dog salmon" because Alaskan native peoples would only feed it to their sled dogs. Others claim the nickname came from the fish's canine-esque mandibles and many teeth. Either way, it's a fact that chum salmon are commercially undesirable, and so king salmon are a big step in the right direction. 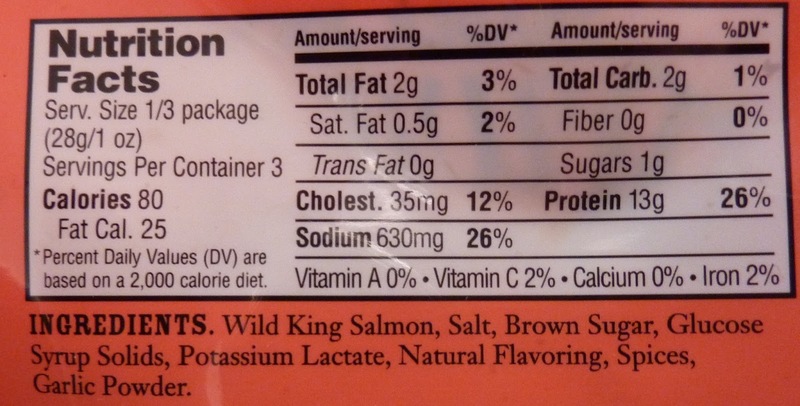 And best of all, they're still "wild," or "free range," like the salmon in those fictional breakfast muffins. But still, this product is amazingly fishy. I mean, it's almost completely made of fish, so I don't know exactly what I was expecting. I guess I was thinking that the jerkifying process would make it significantly less fishy. But no. Still quite fishy. And to add to the fishiness, you can actually see where the scales were on the salmon chunks (see pic). So yeah. Fishy. Good thing I like fish. My dogs do, too. No matter where in the house I opened this package of salmon jerky, the dogs smelled it immediately and were at my heels, begging for scraps. I mean, sure, they do that for everything, but they seemed especially enthused about this product—probably because of the fairly pungent fishy smell. I'm pretty sure if they were going to score this product, it would get 10 stars. But unfortunately, the humans in the house weren't quite as wowed. However, I must admit the quality of the "meat" itself is pretty good. There's a nice smoky, spicy, sweet flavor to it. And it does taste like salmon—certainly not the best salmon I've ever had, but not the worst salmon I've ever had either. 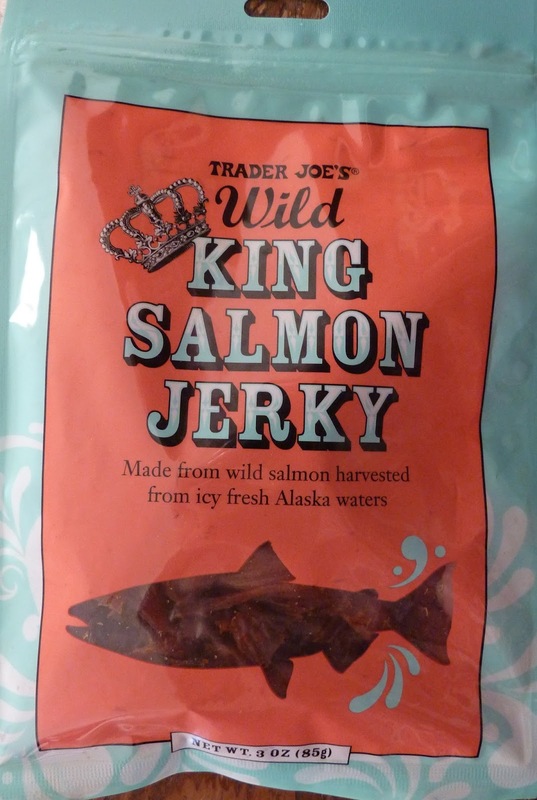 The texture is pretty close to traditional jerky, although this salmon stuff has a tendency to flake off in little angular chunks, similar to the way a normal fish fillet would. It's also more oily than any other jerky I've had lately. You'll pine for moist towelettes after handling it. Even if you're a huge fan of the taste and texture, it's a little on the pricey side. I can't see this ever becoming a regular purchase in our house. It's not terrible, though. I'm just glad I'm not the one who tried the version with chum in it. 3 stars from me. Sonia was initially overwhelmed by the fishy smell, but got over it quickly. She gives this product 3.5 stars, and insists that it tastes somewhat like bacon. I'm not sure where she's getting that from. Silly Sonia.